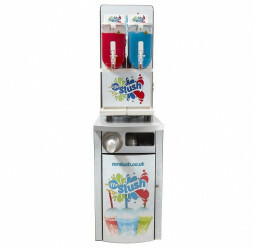 High quality slush machine stand, fully branded for maximum impact. Includes cup holders, lockable storage, waste bin and optional rear panel branding. LEAD TIME - 5 WORKING DAYS. Premium heavy duty slush machine counter display stands branded Mr Slush, just 50cm wide and which fits the twin 2 x 10Ltr Mr Slush machine.